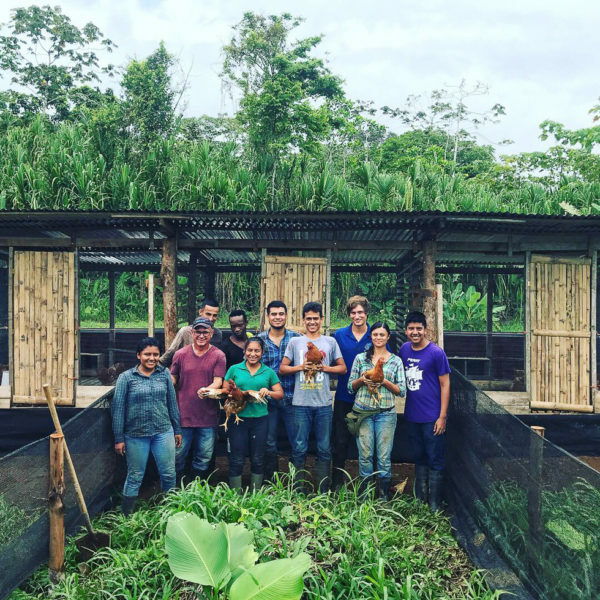 The Lab’s 2018 Sustainability Prize at EARTH University was recently awarded to Mariana da Cruz Albertazzi and Raphaël Loubert for the project: Agrosilvopastoral system with free range laying hens. We spoke with the prizewinners about the benefits of agrosilvopastoral systems and their plans for a scale-up of this project. Please enjoy this interview with the prizewinners! The Lab: Why did you decide to focus on an agrosilvopastoral system over other sustainability related projects? Mariana and Raphaël: Our area of expertise is agronomy (a branch of agriculture that deals with soil and crop management). We focused on agrosilvopastoral systems because they rely on ecological principles that allow the closure of cycles, using the residual products of one production cycle to feed another, thus reducing the need for external inputs. For example, the animal component of the system (in this case, the hens) contributes to the control of weeds and pests, as well as the improvement of soil fertility with manure. The forestry component provides forage species (plants that are grown to be eaten by livestock), which are rich in nitrogen and serve as food for the animals and as a fertilizer for the soil. Finally, the agricultural component can generate short- or medium-term income for communities and food for the animals. 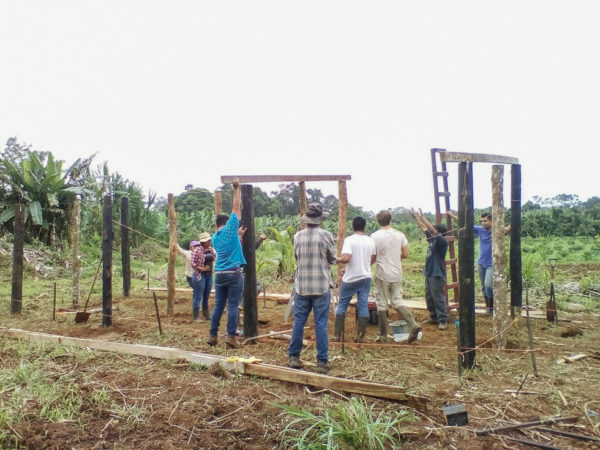 Taking into account that this type of system is environmentally sound, we proposed a project that can also be economically sustainable (by taking advantage of each available resource and its contributions) and socially (by functioning as a model farm and promoting the establishment of this type of business among the members of the community in which the project is located). The Lab: What made you choose to implement the scale-up of this project in Bajos del Toro? Mariana and Raphaël: We decided to implement the project in Bajos del Toro because we have a family plot available to be developed there. It is also an advantageous location because this region of Costa Rica attracts a lot of eco-tourism, which makes it feasible to give the project an agro-eco-touristic approach. However, this kind of project can be developed in almost any part of the world, by taking into account that the animal and plant species implemented are suitable for the edaphoclimatic characteristics of the region. The Lab: Based on what you learned from the pilot project, what changes do you plan to make when implementing it on a larger scale? 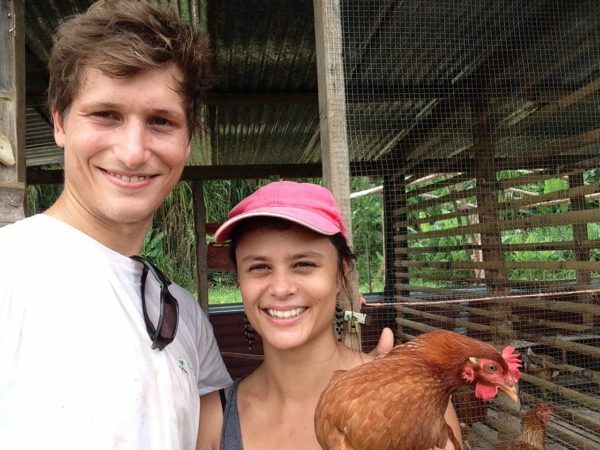 Mariana and Raphaël: In the pilot project we tested three diets for hens that had different proportions of concentrated feed and of the plant Alocasia macrorrhiza, with the aim of reducing food costs. We chose Alocasia macrorrhiza for this experiment primarily because it is a plant that has high nutritional value, grows easily, and requires little care at the agronomic level, making it an economically viable alternative to the use of concentrated feed. Thanks to this, we discovered that we can reduce the use of concentrated feed by 30%. 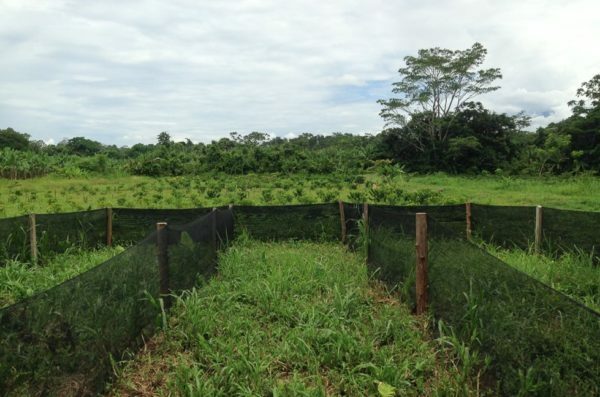 In addition, it was determined that a hen can control 95% of the weeds in 2.1 square meters in a period of 48 days, which will allow us to define the exact number of hens we need in a given area to control a certain percentage of weeds and, in this way, reduce the use of labor for weed control. The Lab: How did The Lab’s sustainability principles influence the development of this project? Mariana and Raphaël: The Lab’s Sustainability Prize at EARTH University motivated us to develop this project in its entirety. We went from having just an idea of ​​something that we are passionate about, to working on it and developing it into a feasible project. The sustainability principles guided the development of the project. For example, our project covers the material perspective by ensuring the closure of cycles, which as we mentioned above, uses the residual products of one production cycle to feed another, which reduces the need for external inputs, waste of resources, and the generation of contaminants. The aforementioned also translates into a reduction in production costs (which contributes to the economic sustainability of the project) and into the preservation of life by reducing the use of agrochemicals that put at risk the preservation of flora and fauna, as well as human health. Regarding the social approach, the project seeks to motivate the generation of similar businesses among producers in the region. We hope to form partnerships with the objective of reducing production costs and facilitating the performance of certain tasks (for example, the marketing and transport of products to the points of sale). In addition, the project will have an agro-eco-tourism approach that will promote awareness among the general public regarding the need to produce food in harmony with the environment and with the people involved in its production. Finally, our project covers the spiritual domain simply because it will allow us to do what pleases us in life, which is to design and implement efficient and environmentally friendly food production systems, giving us the opportunity to have constant contact with the soil, the food that nourishes us, and with the people who produce and consume it. The Lab: What are you hoping to achieve with this project in the future? Mariana and Raphaël: We wish for this project to be established successfully in Bajos del Toro, and for it to generate data and serve as a model for other agricultural producers in the region and around the world. The idea is to establish the agro-forestry component at the beginning of the year 2021. Later, when the plants have a suitable height and development, we plan to introduce the animal component, which in this case would be laying hens. Subsequently, a food processing plant will be built to give added value to the agricultural products obtained. We wish Mariana and Raphael luck in their future persuits, and we look forward to seeing how they implement their scale up in the coming years! For more information about The Lab’s Sustainability Prize at EARTH University, please contact us at admin[at]sustainabilitylabs[dot]org.